There’s been a nasty tummy bug doing the rounds at school and young children are particularly generous with germs. However often you remind them to wash their hands, fingers will go into mouths and then into shared resources, and by story-time, everyone is throwing up. So – in common with most schools – we have a rule that children should stay at home until 48 hours after any bout of sickness, just to try and stem the spread. For a working parent, though, a vomiting child is a logistical nightmare, especially if you’re not blessed with able and willing relatives. And these things always happen just when it’s really difficult to take time off work. No child-minder will take them and few bosses would welcome vomiting off-spring in the office. Annoyingly, once a child has actually been sick, they often seem a lot better, so the temptation to send them in to school can just be too… well, tempting. He’s fine now. She really wanted to come. He wasn’t properly sick – just drank his orange juice too quickly. Just had a bit of a cough. So it was, that Mrs Acorn was treated last week to a child writing in their newsbook, with beautiful phonetically plausible spelling: ‘I vomited in my bed this morning’ accompanied by a drawing so graphic that you could have made a menu. This prompted four others to share the news that they too had been sick at home. One lad claimed to have ‘green poos’ though this turned out to be due to using the loo just after an application of Toilet Duck. Unsurprisingly, Mrs Acorn and her nursery nurse were subsequently struck down by the sickness bug, though we have yet to see the illustrations. I was reminded of the time – the day after a Bank Holiday weekend – that we received the message that Berenice and her sister wouldn’t be coming to school, as they both had tummy bugs. The following day they were back, and bouncing with the news of their camping trip. Just got back last night, apparently. Had a great time. I couldn’t resist commiserating with their mum when she picked them up: such a nuisance having a tummy bug when camping! Quite. I went to a meeting at the Royal Free this week as part of a ‘Parkinson’s User Group’ so give our thoughts on a website linked to an interesting research project, which is being funded by Parkinson’s UK. Apparently, in their search for a rogue gene which might be a factor in starting off the PD, the researchers are comparing the genes of people with the condition to those of siblings who don’t have PD. All the genes they have in common can then be excluded, helpfully narrowing the focus. Every time I meet researchers, I am heartened by their enthusiasm and optimism, and awed by their expertise. Pa did more than his bit this week towards funding this research by taking out a subscription to the Radio Times, one of the companies which signs up to the GiveAsYouLive scheme. He’s also used GiveAsYouSwitch when renegotiating his gas and electricity. If you haven’t already got an account, please consider doing so – very easy and completely free – and then remembering to use it (my Achilles heel) every time you buy online, so that a donation goes towards a charity of your choice. Both Parkinson’s UK and the Cure Parkinson’s Trust are among the linked charities, but there are any number of worthwhile causes. GiveAsYouLive can be reached through this link. 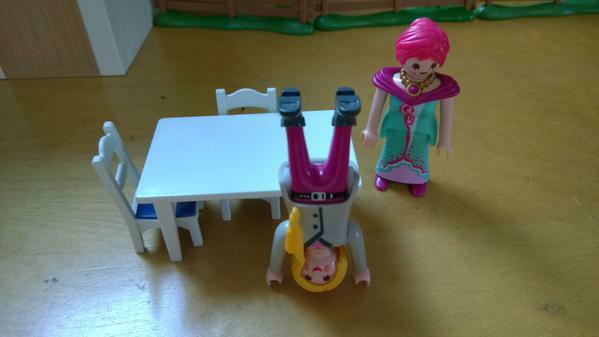 If you follow The Archers, have you yet discovered @ThePlarchers on Twitter? Someone creates scenes from that week’s episodes using Playmobile people and then live tweets them along with the omnibus. Genius. Here’s one to be going on with. You’ve really crossed the line, Kate. Ha, all schools and parents everywhere.. I once got a letter from a parent explain their child had been absent because he had a ‘dire rear’. Technically a misspelling, but sooo much more descriptive.